We got a chance to check out PAX West, and here's what we have to tell you about one of the largest gaming conventions around. PAX Prime has long been a grand-scale convention, expose, and gathering event for consumers of gaming media and press alike! Having attended for the past three years myself, I could not pass up the opportunity to attend this year, and to tell you all about it. As PAX has gone from a small-scale, passionate fan meet-up to the larger, corporate media gathering that it is today, the experience has been less and less personal and individualized. In the age of YouTube and Twitch, you needn’t go far to find a sneak peek of the newest AAA titles, and to this end we spent the majority of our time around the Indie Megabooth. There are many impressive new titles I am now quite excited for, that you might not have known about beforehand! The crew and I had a fantastic weekend, and here are some highlights. Kickstarted back in 2013, Chasm is the passion product of Executive Producer James Petruzzi and the team at Bit Kid, Inc. Chasm takes inspiration from hack ‘n slash dungeon crawlers and Metroidvania-style platformers. Mixing the nuances of modern iterations such as Dark Souls with the old-school tight mechanics of Castlevania, Chasm creates something new yet familiar. For veterans, it plays exactly how you’d expect and you can hop right in and start slaying baddies immediately, though the self-explanatory base gameplay ensures the learning curve is not too steep either. Speaking with James, he told me a lot about their design philosophy going into Chasm. The plot is more a device to setup the gameplay and can be completely ignored if someone chooses, though there is more to the story than that. If someone has questions, they can seek out the answers through conversations with NPC’s or in the descriptions of items they can come across. From there, the sequence of zones and how you will progress through the game will be roughly the same each time, though the order of individual rooms will be randomly generated. This makes each playthrough into a vastly different experience. Even though I had only a short period of time to actually try Chasm for myself at PAX (I died pretty fast) I am extremely excited to give it another go soon. Advertised as the game where you can Design your Own Spell, “Mages of Mystralia” gives the player the power to place any number of elements, physics, tactics, chemicals, and all kinds of things into their own Rune. From there, casting it can unleash pure insanity; depending on the players customization. Using your limitless arsenal to wage combat and solve puzzles in Zelda-styled dungeon crawling, it’s a constant joy testing out not only what you can do, but what the game can’t stop you from doing. The adorable artstyle and storytelling are a fitting bonus to the package that made “Mages of Mystralia” certainly memorable for our crew at PAX. The aptly-named “Just Shapes & Beats” consistently had a massive crowd around it all PAX weekend, and for good reason. The combination of rad as hell music, frenetic visuals, and pick-up-and-play gameplay, led to a fantastic crowd pleaser. Each individual song has a stage custom-made for it, so that every beat has its own shape. Speaking with developer Lachhh, he gave insight into the development process. Having created a large compendium of games so far under Berzerk Studios, “Just Shapes & Beats” is their first one developed for consoles. Having exclusively used Flash in the past for PC releases, porting it to Unity posed a grand trouble. Past that, the game is expected to launch by early 2017, though they will be designing additional courses for the game free of charge post-release as well. One man’s dream: “Shoot Shoot Mega Pack” is developed solely by Jon Remedios. It aims to be THE game you load up when you have some bros over, pass some controllers, and want to have a great time immediately. You control a little, Asteroids-eque spaceship, and fly around aiming to gun down your friends, with a twist. Every different stage you find yourselves on has a unique trick. Everyone’s invisible unless they shoot, everyone shoots at the same time, your shots just knock each other around, etc. It’s consistently inconsistent and inspires far too many laughs to be legal. Reminding our crew a lot of last year at PAX with Ultimate Chicken Horse, “SSMP” brings the same spirit of fun to local play once again. The incredibly stylish Flinthook developed by Tribute Games promises some deeply intense physics based platforming. Utilizing your trusty chainhook and some fashionable slow-motion powers, you can platform your way throughout vibrant and funky retro pirate ships in deep space while blasting them into bits and making off with the loot! As should be expected with a game based so much on retro mechanics, the controls are perfect; as fluid and flexible as you could need with the solid fundamentals to leave any errors up to you. Immediately upon grabbing the controller, I was zipping from hook to hook testing the capabilities, and it wasn’t long before putting that into application. With staggering amounts of enemies coming at you, it can be overwhelming if you don’t remember you can slow time at will. Using every tool at your disposal to dance around the opposition is paramount to your success: and it feels oh so good. 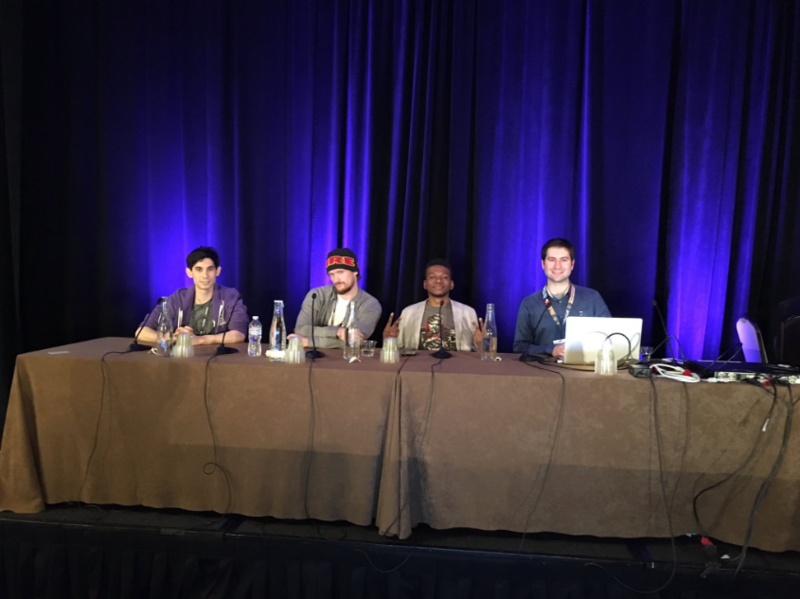 Wrapping up the weekend took us to the Hyatt Hotel for a panel featuring four pillars of the competitive Smash community. Telling an overview of the narrative that forms over 15 years of a game’s history, with players rising to be gods, and kings falling, it was exceptional insight to the scene. Having a broad range of perspectives present, from a professional player to a documentarian, to a commentator and a community manager. Seeing these different community leaders united at here at PAX by this one game that they all love is a beautiful thing, and a testament to the legacy of the game. Those were our team’s highlights from PAX West 2016! We will be reaching out to the developers of these different games and definitely following their progress as they approach release, so be sure to look out for updates from here at n3rdabl3.